Webbing around rope to prevent abrasion? Discussion in 'Tech Tips and Gear' started by NateFlet, Aug 30, 2018. So my friends and I are planning to descend some canyons involving some pretty large waterfalls. My main concern on these rappels are the abrasion cause by the sharp rock on the rope (Damn Hawaii and our lava rocks). My first idea was to creep the rope over the edge, but since I dont have too much experience creeping the rope, I kept thinking. My most recent idea is to take some 1” tubular webbing and placing it around the rope to act as an extra sheath around the rope. The webbing would cover about the first ~30ft of rope from the anchor on the rappel side. Heres somewhat of a diagram I drew of the set up. 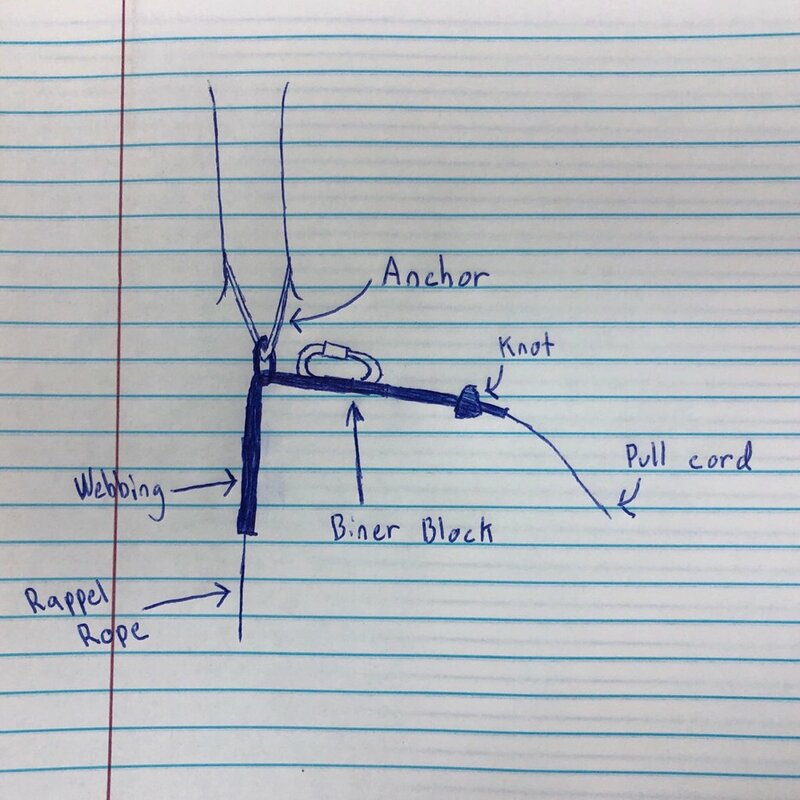 The knot behind the biner block (on the pull cord side) would be probably just an overhand, and would help prevent slippage of the webbing around the rope. Any thoughts on this idea? Would it be safe to rappel on? If the rapid link is large enough, it should not be a problem. But you might want to do some testing -- I am thinking test pulls would reveal whether the setup would have too much friction to pull, or otherwise jam and not be recoverable. Based off a few tests, the rope pulls flawlessly, but I encountered a new problem. It seems that getting the webbing (in one piece) around the rope is quite a challenge... the rope easily slips about 9ft into the webbing before friction takes over. Besides slowly inching the rope into the webbing, any other ideas on getting the rope through ~30ft of tubular webbing? What diameter is the rope? The easiest way is to use something rigid, like a wooden dowell and an small eye screw to thread something like 2mm cord through the webbing first. The using a pile hitch and a series of half hitches, pull the rope through with the cord. Two people or a good anchor to tie the cord to with a long straight shot will make this significantly easier. hank moon and NateFlet like this. Im having some trouble understanding what you mean by using a wooden dowell or a screw to thread the webbing? Use a 2 foot long, 5/16” wooden dowell to thread the small cord THROUGH the webbing. It’s much easier to thread something rigid through webbing rather than a floppy rope. You may just be able to tape the rope directly to the dowell. Being sure the the tape overlaps are facing in such a way the the webbing won’t roll the edges back and make a sticky mess. I’d send some demo pics but I’m away from shop right now. Regardless of the outcome of the webbing experiment (good luck, BTW), creeping is a good skill to know. Pretty easy to practice, too. C'mon - learn to be a creeper! NateFlet and Kuenn like this. We use/have used lots of different types of rope protection in cave environments. Rope protection from webbing/sausage sleeves (like you described), velcro wraps, even discarded firehose (extreme abrasion resistant). They all have their pros/cons. Contingency anchor with a munter mule is my hands-down favorite solution. Fast and efficient, very creepy friendly. That said, sometimes additional rope protection is a must. While the webbing around the rope seems to work just fine and dandy, I may have to agree here with creeping being the way to go. Getting the webbing around the rope is just an extra task that can be easily avoided by creeping the rope instead. Thanks guys for your feedback! I use a small section of corflute (real estate signage) with a bit of 1-2mm accessory cord attached to the pull side to protect significant edges for the last person. Super light, retrievable, durable & cheap. if it gets caught the cord either tears out of the corflute or breaks. For the rest of the group, improved rope management skills are a cleaner solution. creeping the rope, using an empty pack on an edge, or a trick I use all the time is simply placing my foot on the edge and running the rope over the edge of my shoe (if I'm the one managing the pitch for the rest of the group). NateFlet and ratagonia like this. Yea I'll ditch the webbing over the rope idea. I would use other sorts of rope protectors but the (very long) slope downward on this specific drop made me think of some other solutions. It seems that creeping will be the easiest way to go. Thanks for the feedback!!! Kuenn and ratagonia like this.